As I was going to sleep the night before, I suddenly had a pang of fear– would we really be able to descend and ascend Grand Canyon in a day? For months I had told friends and family that a friend of ours gave us suggestions for our trip to Arizonia/Utah and one of them was hiking Grand Canyon in a day, descending in 3 hours and making it back in 5 hours. We told everyone this. A few persons acted skeptical, but I trusted implicitly the knowledge of a friend. You see his son lives in Arizonia and he really seemed knowledgeable of the area and what people could handle. But suddenly, I thought … but I’ve only known this man for a few years…what if he’s wrong? I’ve built this whole day that includes 4 other family members around my trust in this person’s judgment… but, soon I fell asleep. I awoke at 5 am for a 6 am descent down Grand Canyon. The night before we had packed peanut butter and jelly sandwiches, along with healthy snacks of Fig Newton’s and granola bars. So all 5 of us crisscrossed around the small Yavapai Lodge room at the rim of Grand Canyon to then board our rented van, followed by a Grand Canyon shuttle that dropped us off at the South Kaibab trailhead. Despite our early rise and coordinated efforts, we began our descent at 6:15 am. We were all in good spirits buoyed by the morning shade and the cool temperatures. We stopped numerous times to take pictures and congratulate each other for our journey, including Ooh-ahh Point, Cedar Ridge, and Skeleton Point. At Skeleton Point, a mere 3 mile hike, we took amazing pictures on some overhanging rocks (see picture above). We were feeling good. But somewhere in between Skeleton Point and the junction of Tonto Trail, we seemed to run out of steam. Perhaps it was the travelers coming up that told us we were not quite ½ way down and that they had started at 5 am in the morning, or perhaps it was the dry desert conditions that felt inhospitable to human life. Whatever it was, by the time Ken and I reached the toilet facilities at Tonto trail juncture, we were feeling breathless and needed the shade of the small wooden deck. We were starting to feel the effects of the hot mid-morning sun. The thing we didn’t realize is that we were over ½ way and had hiked 4.4 miles of the 7.1 mile trek down. We used the port-a-potties, but were a bit more sluggish to head out in the hot white sand of the trail. My toes were already sore from the constant downward movement of toes against hiking shoes (which eventually led to the loss of a toenail). But our 3 children were obliviously driven by some adrenalin-induced high and had even taken an added excursion up a nearby mountain peak near Skeleton Point. Soon the Colorado River came into view, but to me it looked very far away with small ant-people nearby. I was no longer sure about this whole day hike in Grand Canyon but trudged on. Miraculously, by 10:30 we made it to the bottom of the canyon and were soaking our hot feet in the cool and refreshing Colorado River. We ate our lunch. Already my husband was talking about making it up to the rim before dark and fearful of snakes and coyotes that we had seen on the introductory IMAX movie the day before. I didn’t even want to think about the trek up and, in fact, was seriously considering paying for a helicopter ride up. I felt haunted by an inexpressible fear of being deep in a canyon with no way out. I hid away under a bridge where I sat in the river, trying to block out concerns and relieved of the scorching sun and 103 degree temperatures. The concerns kept interfering with my rest and relaxation in the voice of one of my sons telling me that we should be heading up the canyon wall again. Now, one thing was clear from our advising friend: we shouldn’t try to hike in the mid-day sun. It was what killed hikers and we needed to remember to start back after 3 pm to ensure our safety. So with that in mind, I kept telling my family, no, we needed to wait. Well, when I realized they all were insistent on going up earlier, I relented with a river-soaked jersey to renew my spirits. The first mile was hard with too much heat and too much hot sand. We didn’t go very far till we had to take a break. We were now on the Bright Angel Trail which hovered for the first few miles around the curving Colorado River, ascending and then descending again, but continually hugging the river. As if God took mercy on us, amazingly the sun disappeared behind clouds after a few miles and the sun gave up her relentless torridity. There also was a slight breeze that appeared around the shade of the Indian Gardens, 4.4 miles into the 9.3 mile hike up. About this time, our children grew impatient of their parents’ slow meticulous pace, so they were often about 10 to 15 minutes ahead of us. When we’d finally catch up to them, they had been resting for 10 minutes and looking totally refreshed, anxious to be on their way again. Ken and I often did not rest enough because we were eager to keep up with our kids, so took a short 2-minute break and continued on with our children (see picture above). Soon our daughter, who had not eaten her lunch and had come to the end of her adrenalin push, began lagging behind her older brothers. We forced her to eat and soon she regained some of her former strength and was up ahead of us again. The once fairly full trail was being weeded out by hikers opting for the Bright Angel or the Indian Garden Campgrounds. There was one couple that we kept seeing and seemed to be on the same crazy hike down and back in one day. Their names were Robert and Juliana and they were the one constant among ever challenging switchbacks and steep inclines. After Indian Gardens and the warned sighting of a rattle snake, Robert and Juliana seemed to be the only ones on the trail. Our kids were far up ahead and we were lagging, still wondering if we’d actually make it to the top. My oldest son had my backpack, which at times was being carried by my daughter in exchange for her backpack. Water was not a problem due to our resources and the plentiful refilling stations along the way. Robert was a considerate companion to the more beleaguered Juliana. He appeared to be a fit 30-something that kept talking and encouraging Juliana as she felt the weight of descending and climbing in one day. Typically, they would hike for 1/8 of a mile and rest. We then would pass them on our 1/8 mile attempt before suddenly squatting on the rock’s edge in exhaustion….only to see Juliana and Robert coming towards us. We did this for at least an hour before we started hiking together as a foursome. Ken felt particularly discouraged after reaching the 3 mile rest house by the distance left to ascend. We’d glance up and the red peaks didn’t seem to get any closer. The last 2 miles was where we encountered a family of bighorn sheep. The young goat-like kids scampered up and down the rocks, sometimes running full-tilt right towards us on the trail, but then would make an abrupt turn up the mountain. This made our daughter turn around and hike down towards us in tears. With the bighorn sheep staring at us from inches off the trail, Robert led all 5 of us with a calm-talking, quiet-stepping approach up the mountain. Phuuu, we had made it past another barrier to the rim. The last mile felt grueling and we were only going through the footslogging motions of counting steps, stopping in exhaustion and pulling ourselves up again. Luckily, Juliana and Robert had walked down a short distance of the trail the night before and just about the time we were ready to give up, they started recognizing landmarks and knew the trailhead was close at hand. They were a gift from God and indispensible to us in reaching the rim. Watching them struggle and continue to get up and walk was a formidable encouragement. When we had last spoken to our boys, my one concern was that if we didn’t make it to the top, they might be able to come down the trail with flashlights so we could find our way up. In the end, this wasn’t necessary. 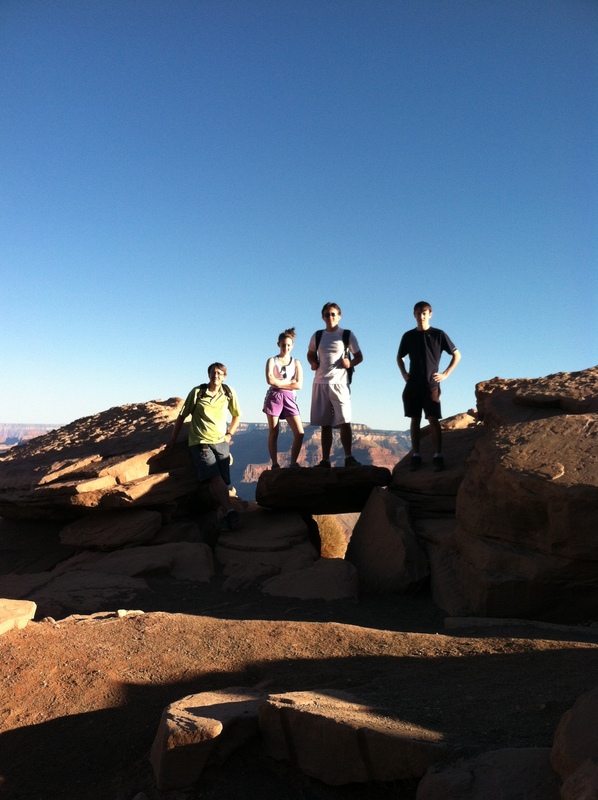 We had started out at 1:30 pm and 7 hours later, we saw the rim of Grand Canyon with applause from our 3 children. It was a bit past dusk but we could still see their proud faces. We took no time to jump or dance at our accomplishment, but hurried with Robert and Juliana to a packed shuttle bus. All eyes were on us as we walked to the back of the bus, covered in reddish brown filth …and huge smiles. Mary Histand Reinford is a strong woman but she may have gained her strength from hardships she experienced throughout her life. Mary was born in Doylestown Township on July 21, 1932 and grew up in the Doylestown Mennonite Church as the fourth child of Daniel and Nora Huddle Histand. Her parents had a total of 11 children before her mother, Nora, passed away at the young age of 44. Since she was one of the oldest girls, she took over the kitchen and cared for all of her younger siblings. She remembers that the year before her mother died she was told by her father that she could attend Lancaster Mennonite School (LMS) as her sister had. Her trunk was packed but Mary refused to go, mainly because she knew she would get too homesick. So her father said since she didn’t want to go to LMS, she would stay home and help her mother. This was a hard decision for Mary to take, but she believes today that God knew her family would need her, because during that school year was when her mother died of a sudden heart attack. After her mother died, the children didn’t feel like they could talk about her, but Mary and her sisters found solace in their bedroom where they poured out their hearts to each other. Her father soon married her aunt, a widow from Lancaster, and Mary was “farmed out” at the young age of 16 to work for Eastern Mennonite Homes (EMH) because “you can’t have 2 women in the kitchen.” When their aunt came to live with them, her father chose a different bedroom for him and his new wife and the girls got to stay in their mother’s bedroom where she had died. It was there that they talked quietly about their mother and found comfort in each other. At EMH, she was the only teenager among many older persons speaking Pennsylvania Dutch. She felt very alone that summer and wanted to go home, but when “I called home, my father said, ‘if you come home, you’ll get a good lickin’ and then go back again.’ ” So she decided to stay, but cried herself to sleep each night for 3 months. Finally, her father told her she could go to Eastern Mennonite School (EMS) in the fall of 1949 to finish her education. This time she went willingly with no objections or fears of getting homesick. “I wanted to learn and I loved being the hostess at meals.” The lively Mary blossomed at EMS and when everyone gathered for meals in the cafeteria, she was appointed hostess along with a male student as host to keep the conversation flowing around the table. During the summers in between high school years, her father got her a job at the Pearl S. Buck Welcome House as a cook. She cooked the meals and helped attend to the Amerasian children that stayed at the welcome house. The host couple, a Yoder family from Zion Mennonite broadened her Mennonite perspective and she has remained close to the family ever since. “Because I gave all my earned income to my father till I was 21, Mrs. Yoder was the one who bought me luggage and a few items of clothing.” She spent two summers working there for Pearl S. Buck and got to know the famous author well enough to “take coats” at her personal parties. 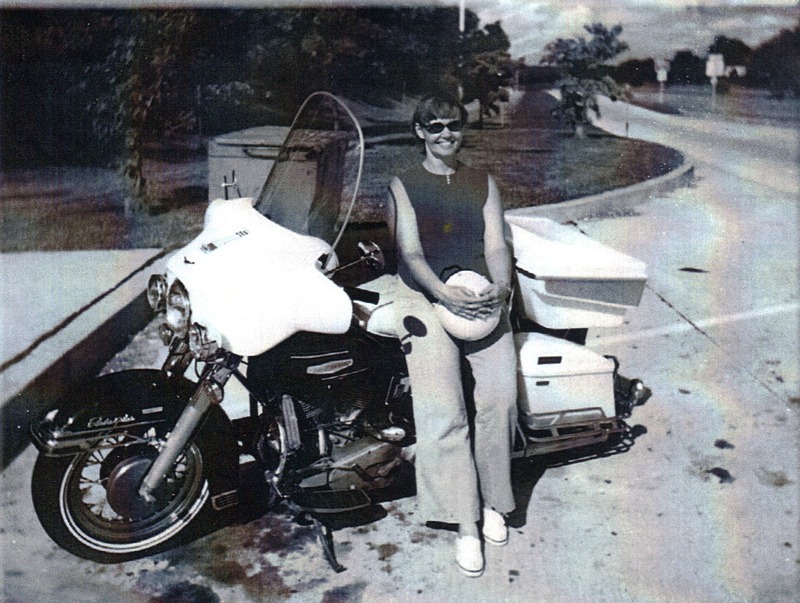 When Mary was 21 and she had graduated from EMS, she decided to do a short term of voluntary service in Rittman, Ohio with a friend, Ruth Gross. She remembers the long trip to Ohio by train on January 1st and how the train was filled with service men returning after the holidays. Her friend, Ruth, got homesick and returned home early, but Mary completed her 3 month term and returned home alone by train. She worked at a laundry in Doylestown for awhile till she realized she wanted to go to college. She took her GED and made plans to attend Eastern Mennonite College. But in 1955, she also met a handsome man from Skippack Mennonite Church that had been told there were nice women “on the other side of the Cowpath” and was driving around scoping out this area near Doylestown. Ernie talked to her brother Herb who told Ernie, “I’ll bring her to Young People’s Meeting on Sunday evening at Souderton Mennonite Church and you can take her home.” They dated after that, but when Mary discussed her plans to attend EMC in the fall, Ernie said, “I’m not driving 8 hours down there.” So, she had a change of plans and they were married in 1956. “Will you love me if I only have one leg?” Thelma Willouer called. She was bleeding profusely and her leg was hanging only by a small muscle when she asked her husband Howard these words. They had just been thrown off a motorcycle and at first they hadn’t realized how serious the situation was. Howard quickly came to Thelma’s side, looking at her leg in disbelief. Then suddenly from nowhere there appeared a young serviceman by Thelma’s side. He told Thelma he had been trained as a medic and tied a tight tourniquet around her leg in an effort to control the bleeding. Thelma still claims this unknown man with the tourniquet must have been an angel or her first husband making a supernatural appearance in order to help her. Thelma Walton Douglas Willouer was born on April 3, 1930 in Indianapolis, Indiana, but raised in the town of Remington. When she was 3, her mother left the family which included her newborn brother, Gene. So they all moved in with Thelma’s grandparents and their grandmother helped raise her and her brother. 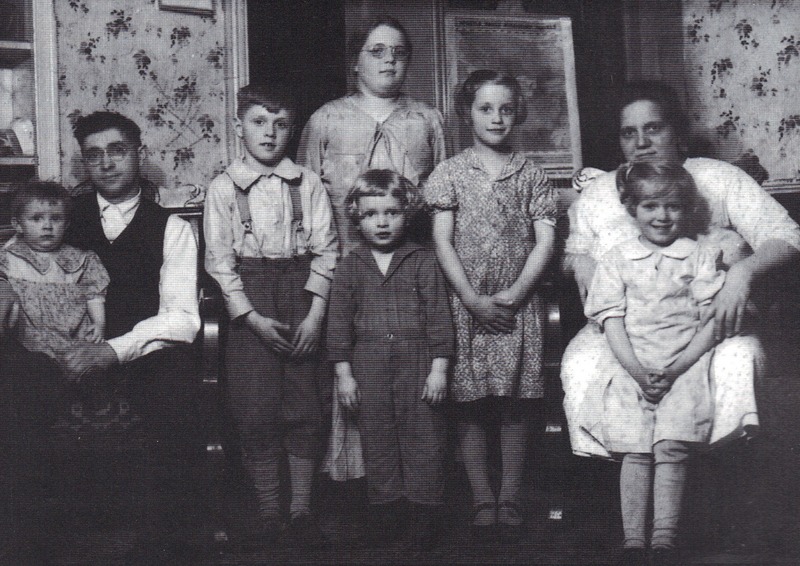 When Thelma was 6 she came down with black diphtheria and thought she was going to die. Her grandmother was the one to nurse her back to health. When Thelma was in 4th grade, her brother wanted a dog, but since Grandma was a meticulous cleaner, she wouldn’t allow it. Gene cried and cried until finally their dad decided to move out on their own… with the dog. So at 10 years of age, Thelma started taking care of the household, which included watching after her younger brother. In high school, she got very sick again, this time with scarlet fever, but again she miraculously recovered. She soon fell in love with a guy she had known since 1st grade, Cary Douglas. Cary and Thelma graduated in May 1948 and were married in Sept 1948. By 1960, Thelma had 5 children and was having hip problems. After hip surgery, Cary wanted to take on another job to cover the costs of the hospital bill. But after only a few days of driving a forklift at a loading dock, Thelma received the stunning news that her husband Cary had been killed when he accidentally drove off the edge of the dock. “Things were rough at first,” says Thelma of her early days with 5 kids and a new husband. But before they knew it, the children were growing up and moving away from home. 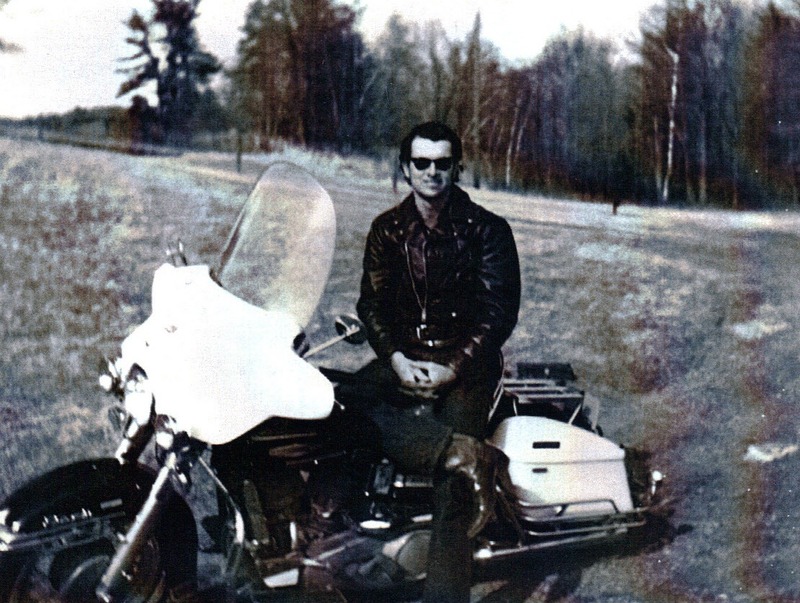 Soon they found themselves with more free time to do things like motorcycle trips together. Soon after she came home, she began working again at Greene Tweed in Lansdale as a key punch operator and worked for 14 years after the accident. In 2004, while attending the funeral of Howard’s uncle, Leroy, the Willouers heard Gerry Clemmer preach for the first time. They were so impressed that Thelma said to Howard, “You used to be a Mennonite; let’s try it out.” They have been attending at Souderton Mennonite Church ever since. Thelma has had some more complications in recent years with her back, due to her legs being uneven and wearing special shoes, but she still attends church with the help of a cane and makes all the meals at home. Thelma doesn’t deny that her life has been full of miracles, admitting to being like “a cat with 9 lives. So often people thought I was going to die.” Luckily for all of us, this generous and kind-hearted woman is still alive today.